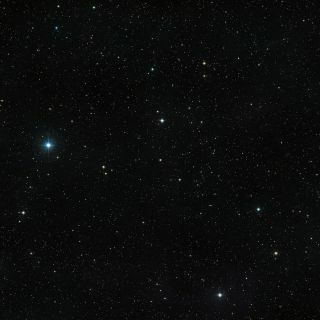 This image shows the larger area around the double star V471 Tauri, created by the Digitized Sky Survey 2. A new alien planet-hunting tool has found no trace of a brown dwarf more than 100 light-years from Earth, despite evidence that the misfit failed star is eclipsing its partner, a team of puzzled astronomers says. European Southern Observatory's (ESO) new SPHERE (Spectro-Polarimetric High-contrast Exoplanet Research) on the Very Large Telescope didn't find a sign of a brown dwarf — sometimes called a "failed star" — near the double star V471 Tauri, despite the fact that scientists were pretty sure they would find one. The scientists used the ESO observations to create a video zoom-in on the strange star system. The two stars of V471 Tauri orbit each other once every 12 hours. From Earth's perspective, one star regularly passes in front of the other. However, the eclipse timings were not happening as predicted, which suggested something big — perhaps a brown dwarf — must be tugging at the star pair. Astronomers previously mapped brightness changes due to the eclipses using the ULTRACAM system on ESO's New Technology Telescope. But searching for a brown dwarf was impossible until SPHERE was installed, ESO officials said. When no brown dwarf turned up, the leader of the science team performing the work said it showed the theory had weaknesses. "There are many papers suggesting the existence of such … objects, but the results here provide damaging evidence against this hypothesis," lead author of the brown dwarf study Adam Hardy, an astronomer at Universidad Valparaíso in Chile, said in a statement. "A study such as this has been necessary for many years, but has only become possible with the advent of powerful new instruments such as SPHERE," Hardy added in the same statement. "This is how science works: observations with new technology can either confirm, or as in this case disprove, earlier ideas. This is an excellent way to start the observational life of this amazing instrument." The SPHERE exoplanet-hunting instrument attached to the European Southern Observatory's Very Large Telescope. While scientists still don't know what is causing the strange changes, one suggestion is magnetic field variations of one of the two stars may be causing the effect. The stars of V471 Tauri are estimated at about 600 million years old, and are 163 light-years from Earth. Astronomers believe the pair of stars includes a white dwarf – a star that has burned off all its gas – and a normal, sun-like star. Previously, the white dwarf was a star that expanded into a red giant. Material from the red giant transferred to the smaller star, forming an envelope of gas that was later dispersed. Results from the study – the first to be published using data from SPHERE – were published in Astrophysical Journal Letters.